Robert Atkey. From Parametricity to Conservation Laws, via Noether's Theorem. In Proceedings of the 41st ACM SIGPLAN-SIGACT Symposium on Principles of Programming Languages (POPL 2014). 2014. Invariance is of paramount importance in programming languages and in physics. In programming languages, John Reynolds' theory of relational parametricity demonstrates that parametric polymorphic programs are invariant under change of data representation, a property that yields “free” theorems about programs just from their types. In physics, Emmy Noether showed that if the action of a physical system is invariant under change of coordinates, then the physical system has a conserved quantity: a quantity that remains constant for all time. Knowledge of conserved quantities can reveal deep properties of physical systems. For example, the conservation of energy, which by Noether's theorem is a consequence of a system's invariance under time-shifting. 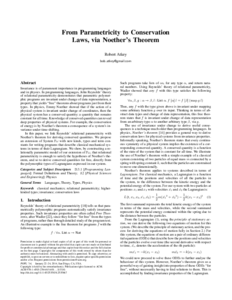 In this paper, we link Reynolds' relational parametricity with Noether's theorem for deriving conserved quantities. We propose an extension of System Fω with new kinds, types and term constants for writing programs that describe classical mechanical systems in terms of their Lagrangians. We show, by constructing a relationally parametric model of our extension of Fω, that relational parametricity is enough to satisfy the hypotheses of Noether's theorem, and so to derive conserved quantities for free, directly from the polymorphic types of Lagrangians expressed in our system.